After reading this passage of scripture, I admire Peter and the other apostles’ boldness to continue preaching the gospel even after they were told not to. I know there are many Christians all over the world who are dying for their faith every day. In America, where we have the freedom to worship God, people do not have to choose between their faith or their life on a daily basis. 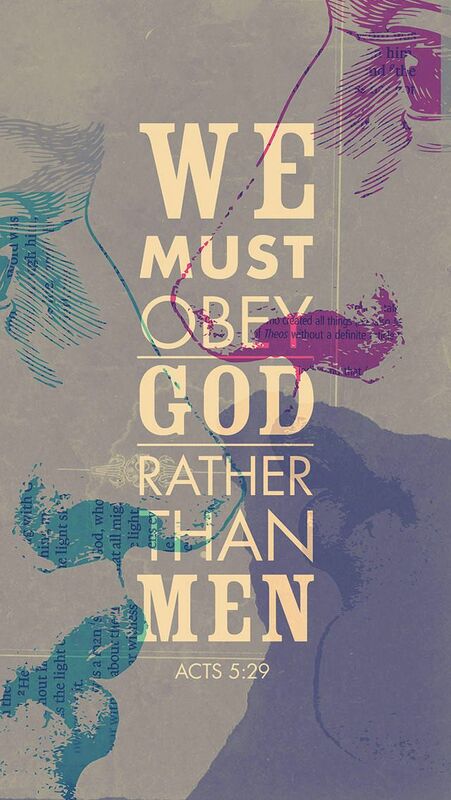 The apostles did choose to obey God rather than men. I believe that God has given people authority for a reason but I do not believe that He would want us to obey any law or rule of man that would contradict His laws. If there is a rule or law that contradicts what the Bible says, then I believe we should not obey it but also not act out in a rebellious way about it. The apostles were punished for disobeying the command of the Sanhedrin but after they were released, they did not plot against them. They continued to do what God had told them to do and that is spread the good news. I always find this passage interesting to me. Peter is willing to die for his belief, he is willing to say the words people don’t want them to say in the name of truth and justice, flash forward 2000 years and we are afraid to tell someone what they are saying or wearing does not represent the nature of the gospel. That would pose the question among some believers is the spirit still as active now as it was then or is it dwindling to a dull roar? I would not say the Holy Spirit has died down a bit, I would however say Christians are spoiled by privilege that we no longer fear for our beliefs. Christianity may not be popular anymore or growing like Islam, but in the U.S. its not legal for me to drag a church out in the street and put them to death because i think they are blaspheming. In this time of “peace” I think we lose the direness that comes with the message, Peter is calling for repentance and forgiveness with passion and urgency. We as Americans like to play church but often forget about the hurting and broken people because its ugly and we don’t want to think about it. The Holy Spirit cares less about the condition of the carpet in the sanctuary and more about the condition of the believers and non believers, what is done for eternity is the only thing that will last. The part that sticks out to me the most about this is how Peter says “whom you killed by hanging him on a cross” at the end of 5:29. In standing up for their faith, the apostles not only preached Jesus, but they were very upfront about confronting the Sanhedrin about the sins they had committed. In total obedience to God, they became willing to lay down their lives for their faith, and confront these other men with their sins in order that they might be forgiven. We also see how these men reacted to this, having the apostles flogged and ordering them to cease to preach in the name of Jesus. Why this sticks out to me so much is because of the modern American church. We have religious freedom; we have no reason to hide or be ashamed by our faith. We have one command from God, which is to spread his gospel to the world, and yet, we are embarrassed to confront people. We may not risk our lives everyday trying to obey God, but we risk our image. The apostles risked everything to confront people with their sins so that they had the chance to take part in God’s love, but we now, are afraid to confront people even on small sins. We need to learn to willing to risk everything in order to be obedient to God, even if it means not being obedient to social norms (man). I think your application makes a lot of sense. Peter was willing to face death rather than being silent. It was not that he was asked to deny Christ instead he is asked to not say something. Peter explains that he must obey God rather than men. In Luke 22:54-62 we see the story of Peter’s denial of Jesus. I think that it is interesting that Peter is the one who was so bold to say these thing even though he had denied even knowing Jesus in the past. As you said, their boldness was empowered by the Holy Spirit. If the church today is going to apply this particular passage to their churches in the way that you suggest, then I believe part of this must involve praying for boldness as the believers did in Acts 4:27-3. I think that this boldness is an example of the power of the Holy Spirit in Acts but that today the Holy Spirit can still empower the believer for boldness. However, we must be willing to take a stand and boldly speak even though we may face discomfort or even persecution from the world. Peter gives a great testament to what it truly means to live a life for God. There is always the battle between the world and God. I remember learning about the temporal world verse the eternal world in a theology class a year ago, and it really stuck with me to think that this world is temporary and it is important to live for God instead of living for people. I take comfort that I belong to Jesus and that I will be with Him forever in eternity instead of being here on earth. Knowing that the time on earth is limited, the time should be used to serve God and show others the love of God. Peter preaches the gospel to people that have the power to kill him and instead of being afraid, he stands before them with boldness. I agree with you Professor Long that Christians need to pray for a boldness to be able to preach God without being fearful of what others may think. Being completely honest, if someone challenged me in something I thought I was right in or knew so much about I would get pretty heated as well. But I also don’t think I would have been as outgoing as the apostles and Peter as they stood infront of the people who wanted to kill them. To be empowered by the Holy Spirit in that way, wow! As believers if we could have that same faith and obedience to God, the shift in how Christians are viewed in today’s society would be drastic. Instead of beginning to fade into the background we would be more “powerful” and maybe reach more people. God’s plan is sovereign and somethings I will never be able to understand that but seeing Paul stand up against people who wanted to take his life definitely inspires me to stand up for the name, life, death, and resurrection of Jesus. Maybe part of the reason Luke put this into the scriptures as motivation and inspiration for future believers. What makes this passage so incredible to me is Peter’s willingness to stay true to what he knows to be true in the teachings of Christ Jesus whom he witnessed in that “you must obey God rather than man”. In Matthew 15, a few Pharisees and other teachers of the law approached Jesus and asked him “why do they break the traditions of elders and not wash their hands?” Jesus replied by asking them why they would break the command of God for the sake of tradition. Putting God first in your life was a key aspect in Jesus’s ministry and Peter clearly doesn’t forget that in Acts 5. This however isn’t an easy thing to do. Peter risks being killed but believes it is worth it. I think that fact alone gives a great apologetical argument for the existence of The Holy Spirit as Peter was an eye witness to Jesus and was willing to fight for the truths Jesus spoke about as he knew his divine power and authority. While reading this blog post tonight I remembered a youth group lesson I went through about five years ago. It was a video series on being a fan or a follower. Fans sit in the crowd, cheering on during the good parts of the game, watching from a distance. Followers, however, are the ones in the field, getting dirty, playing, getting hurt. The difference between the two is one is willing to risk everything to get to the win. Fans simply just are there to watch, but not actually take the risks in their life. Here in Acts 5, we see Peter and the other disciples being followers. They do not want to just watch others tell about Jesus or even tell others in secret. They are bold with their faith and preach the good news in difficult situations, “the disciples are characterized by boldness of speech, obedience to God alone, and performance of powerful signs” (Jipp, 58). It is shown in their action and speech, a reputation that followed them. Shadrach, Meshach, and Abednego in Daniel 3, they are another great example of being followers. They risk their lives, and they did not stop after the warnings given. They knew God was faithful, and even if He did not save them, it was still for a purpose and furthering His kingdom. Peter and the disciples did not leave out pieces of the gospel either, they told it straight up, even though leaving out certain parts may have helped them gain favor. These people did not do it alone, the Holy Spirit worked in them and gave them strength and boldness. We look at these bold characters, and ask ourselves, am I going to choose to risk my friendships over sharing the truth, or keep letting them go on with their lives? It is a heart and mind change, to truly want to be bold throughout your whole life, and you need the Holy Spirit to help you. I am amazed about Peter’s courage and faith in God that He is willing to stand up to those that are willing to kill him for speaking of Jesus. I can only hope that if I was in a similar situation that I would have the same confidence in my faith to not stand down to people trying to quiet me. However, while I am not in this same situation there is still application to this in my life. It is not about standing up to politics, but it is learning to be unashamed and unafraid of sharing my faith in Jesus. It is sharing what Jesus has done for me and for all of us with everyone that I meet and not being worried enough about it that it stops me from sharing the good news. This is definitely something I need to work on and have been working on since I was in high school. I need to work on trusting in God to give me the strength to speak up and to not back down due to my fears of what others will think of me. Great Post Alex, I always enjoy reading posts that show a personal side to them because I believe that is the best way to apply these situations to our lives. As Christians we are put in a difficult situation because there are so many new laws in place that go against our beliefs which is always going to be a challenge. The challenge is sharing the truth to people who do not know it but, doing it without causing an argument. Many people stand with what they belief even if it isn’t right. Trying to find an appropriate conversation to be able to preach the truth of the Bible to those who are not believers is the biggest challenge. Similar to Peter we have to be bold in our faith and preach the truth I do not think there is a happy medium between the truth and what is wrong. Peter and the other disciples are willing to die rather than be silent about Jesus. They proclaim boldly the truth of the Gospel, and they make this proclamation in a way that is almost guaranteed to get the killed (Long.) This quote is how Christians should live their lives every day. In the modern world we live such sensitive lives trying not to hurt other’s feelings with the truth. This can affect our faith because people may not believe in what the Bible says causing us to just avoid the problem. Peter and the disciples did not care about what other people believed in because that wasn’t the truth. Peter sets a great example of being bold in our faith as Christians because this is the only truth the world has. The Holy Spirit is still alive and well and this is God challenging us to not hide our faith but, to be bold because people need Jesus more than anything right now. As Christians we must stand up for what we believe in and share the Truth of the Bible because people are trying to find ways to avoid what the Bible says, and it is becoming a reality. Being Bold in our Faith is the only way that we will be able to show people the word of God and what it means to be a Christian. If we do not stand up for what is right people will continue to stretch the truth allowing people to walk over what the Bible truly stand for. In Acts 5 the Apostles are arrested and thrown in jail. But an angel of the Lord appears and sets them free. So they go out and preach about Jesus. The apostles were found preaching, so they were arrested and brought in front of the Sanhedrin for questioning. The high Priest of the Sanhedrin said “we gave you strict orders not to teach in this name, he said. “Yet you have filled Jerusalem with your teaching and you are determined to make us guilty of this man’s blood (Acts 5:28).” To this Peter replied that “we must obey God rather than men (5:29).” Peter goes on to tell how they killed Jesus by hanging him on a tree. And how God raised Jesus from the grave and raised him to the highest position possible. And that God has given the Holy Spirit to those who listen and obey him. Here Peter is standing before a group of High Priests and others who have the authority to have them killed in various ways and yet Peter has the courage to stand before them and preach about the very thing they were told not to speak of. I hope in my own life that if such a thing were to happen to me in my own life that I myself would have the kind of courage Peter had to speak up about my faith no matter what the consequences were. And profess my faith and belief in Jesus like Peter did. As I was reading this verse, it struck me how confident Peter was about what he was proclaiming. I struggled to relate that to something that would make sense in my American life, and like you said its not typically something we can grasp. We can claim that we must love and obey Jesus, but when we say it in our communities, we risk nothing more than some weird looks. Peter was doing this knowing that he was risking everything, and I tried to ask myself that if this was the case for me, what would look different in my life. A lot of our society right now is telling us to obey man, and for us in this climate to call out our faith, sometimes feels like one of the hardest things we have to do, and Peter had the strength and confidence to call out his beliefs in the midst of a situation with consequences far greater than we can understand. I think the key to it is his confidence, is because what he is saying is the reason he can feel so sure to yell because he had already been obeying God. Because he already had to hope and the promise of the Holy Spirit, he could be sure that God had placed it on his heart in that time. I do agree with you that it is hard to grasp this because we are not in the same situation as what Peter was. As Americans we are very fortunate to be able to worship Jesus freely and so we don’t have to worry about being persecuted. But in a way, I would say that this verse is something that Christians in America, including myself struggle with. I think that the confidence that Peter uses to proclaim this is encouraging and is something that we should be modeling our faith to be. Even though we don’t have to deal with the same persecution that Peter did, we do face a kind of persecution today that we have to learn how to be confident in our faith and stand up. I believe that so often in today’s culture we are raising more “pew warmers” or people who just sit in church on a Sunday morning to fulfill a box on their weekly checklist, rather than raising people who are confident in their faith. I wonder if the church today in America was facing the same persecution that Peter and the disciples did would handle it the same way as they did. It is very easy for us to grasp this concept because we are not persecuted for our faith every day. We are in a nation where we are free to practice whatever religion we would like. However, I look at it from the lens that even though we don’t face nearly the persecution that others do, we still face it on a day to day basis. People still look down upon Christians, and there are situations where I have been treated as lesser because of my beliefs. It is something that we still face, but at the same time, we need to be able to look to God, and to stand up for what we believe in. The nature of human beings is to make everything about themselves. At least, due to the fall peoples sin nature corrupts them. When we approach the Scriptures it is easy to pull out things that immediately sound good to our own circumstances, instead of thinking of what the author meant, who this passage was written to, and how there is a 2000 plus year gap when it was written. When you talk about application, you mentioned people, mainly in the west, conclude that this passage supports the protest of governmental systems. For many people that would sound like a helpful motivation. But this goes back to a point I made in a pervious response to the comfort of the American church. We in the west have gotten used to comfort. There are things we can afford that allows us, not just a general type of comfort, but a specific comfort tailored to each individual. This social structure has influenced the way we perceive and interpret the world. Furthermore, when we approach the Scriptures there is an underlying assumption that what is being said in Scripture will benefit my desires, or comfort. I want to be careful not to group everyone in America into this category, because I know there are people who do not think this way. But for a large part of the America Christian church this is the reality. I think Christians in the west need to get back to the truth we find in Romans 12:1-2 and learn how to be transformed by the renewal of the mind through God’s word. We ought to learn how to be a living sacrifice. This passage throws people off just as you have stated. In others eyes it is interpreted as” I can rebel and disrespect authority because God said I need to stand up for injustice!”. Now they do not think they are rebelling against authority because if the authority is corrupt then they must be taken down. Take for example also when Paul is before the high council and stated he had always lived before God with a clear conscience. As a result, Ananias the high priest commanded that Paul be slapped in the mouth. Before they slapped him, Paul replied “God will slap you, you corrupt hypocrite! What kind of judge are you to break the law yourself by ordering me struck like that?” (Acts 23:1-3). The people in the room said to Paul “Do you dare to insult God’s High Priest?” (Acts 23:4). Paul turns it around and apologizes because he did not realize this was the high priest he was speaking to and then mentions the scripture from Exodus 22:28 to support it. The Scripture reference says, “You must not speak evil of any of your rulers”. Peter is before the religious teachers and the religious leaders tell Peter to stop teaching the name of Jesus and filling Jerusalem’s people’s heads that they were responsible for the murder of Jesus. Yet, as Polhill points out, “Peter, of course, was not trying to get the leaders killed but rather to get them saved ” (Polhill, Acts 5:29 The intentions of Peter were not to disrespect the leaders but made such a strong statement because it is what they need in order to see their sins and get them saved. I love also that Polhill points out that the purpose of the bold statement (Acts 5:29) is very much abused and misappropriated in our society to get what they want and use it to support/enable a victim mentality. It must be used in its proper context otherwise you are manipulating Scripture and producing a rebellious divisive spirit to God’s people and delegated authority. The Holy Spirit empowers us to do God’s will, boldly and faithfully, this is a clear fruit of a faithful Christ follower. Let me finish with this, Jesus was asked if He paid the temple tax, and then asked of Peter, “What do you think Simon? From whom do the kings of the earth take customs and taxes, from their sons or from strangers?” Peter answered from strangers. Then Jesus states then the sons are free, and yet he says “Lest we offend them…” cast a hook and their will be a fish there with a cone in his mouth. Use that to pay the temple tax (Matt. 17:24-27). Put simply, the Temple was built for God the Father, Jesus is the Son of the living God. He was exempt from paying that tax. And yet He laid down His rights and privileges and paid it. So, you have one guy who led a revolt against the governing authorities and a guy who laid down His rights and submitted to authority. The person who rebelled (Barabbas) was spared and the innocent man was killed. This is an attitude that is, in my opinion, rarely seen in Christian communities. Those who profess they are liberal Christians you will see the attitude of Barabbas. Speaking evil of authorities and leading a revolt against them to get them out of power. Christians should not fear death because they are dead to themselves and will live forever more with Jesus upon their departure from earth. Therefore, with the empowerment of the Holy Spirit, would it not be better to obey God rather than man? Acts 5:29 states, “Peter and the other apostles replied: ‘We must obey God rather than human beings!’” This statement is so profound. It is not a statement that they will not listen to the leadership placed over them, rather it is them proclaiming that no matter what happens they will follow God. Many of the apostles’ lives were threatened because of the message they were declaring, but in this verse, they state that they do not care. No one what the threat, they will not back down, for they are speaking for the fame and renown of Christ. “This is a model of Christian suffering that challenges the reader to also be ready to stand firm for their faith even though it cost their life” (Long). So often in our world today we shy away from spreading God’s word, and we are not even faced with the brash persecution that the apostles faced daily. They literally had their lives on line, and still said, “we listen to God first,” or “what He says goes.” They lived boldly and fearlessly. Jipp says, “Twice Luke portrays Peter as responding to the threats with statements that they will listen and obey God only, even if it brings them into conflict with other humans” (58). That is what this verse is really about. The apostles are stating that nothing will make them back down. Their purpose is to spread the message of a Savior far and wide. That purpose has not changed and is still real for us…so why do we so often hesitate to share the good news that we have found? I agree with you here Haley that a lot of times in our world we are scared of spreading the word of God just simply because of what ‘might’ happen to us ‘if’ we do that. When it comes to living a life with God and trusting him, there should never be any ‘ifs’ that we deal with. One of the books I’m reading in another class talks about how we as Christians need to go to ‘the gutter’ and not be afraid of getting dirty and the outcomes that come with it. Peter’s defense before the Sanhedrin not only summarized the previous remarks made earlier in the chapter, but it almost seemed like a ‘in your face’ moment. Peter is calling out the people responsible for the death of Christ, but recognizes the necessity of it in order for, but as you said, Jesus to extend “repentance and forgiveness of to sins to Israel” (Long 35). We talked earlier in class about the importance of having two eye witnesses in order to make a testimony credible. I find it interesting that Peter called upon the Holy Spirit as a witness because he would have been a fairly new concept for the Jews to wrap their mind around. The Holy Spirit was only made accessible to all believers at Pentecost, so it is interesting to me that Peter would bring to attention something that may have been widely misunderstood for people outside of the early church. Then again, the Book of Acts follows the movement of the Holy Spirit in the lives of the apostles and early church. The capability of the Spirit to create physical change in the disciples surroundings as well as within the hearts and minds of Judaism is incredible. People want something tactical to believe in and pull out as evidence when needed, but that is what makes Acts 5:29 so pivotal to the Christian movement. I am just like most people when I say that it was crazy (in a good way) to see how confident Peter actually was with proclaiming what he was. I would have to agree with you too in the fact that this notion is something that no real American can actually claim that we do. We may go out and about in proclaiming that we have to be able to accept a live with Christ, but when it comes down to it, especially with our fellow peers that are the closest to us, we basically ‘freeze’. Today in our world, we have all of these big leaders telling us left and right that we have to do things in life a certain way and if we don’t, we won’t be as successful, or not even successful at all. That should not be the case. We all have to be more like Peter and not live our lives as scared about what would come with actually proclaiming to those around you that yes, I live a life that is centered around God and that because I trust in him and obey him, nothing bad will happen to me. Many Americans today have vast misconceptions of what it means to be a Christian in the States. So many people tie their political beliefs to their religious beliefs. This is dangerous, not because setting your political stances based of Scripture is bad, but many tend to shape scripture to fit their political stances by taking things out of context. The moment that politics takes the front seat over God is the moment that it becomes pointless. God should always be our first thought when looking at life, and the Word should most definitely influence our decisions. Many people I see tend to think that the church needs to be directly tied into the government, and that Christian values are most important for the States. While yes, Christian values in government would be quite good, the corruption of those values that can happen when people come to power severely hurts the reputation of Christianity. This is why the idea of separation of Church and state is important, not because we need to take Christ out of our values, but because Christian values don’t always stay Christian when it comes to politics. The civil disobedience that Peter displays before the Sanhedrin, saying he’d die before he’d stop preaching in the name of Jesus, is something we can take away from today. In the States, even though people would like to say otherwise, Christians are really not persecuted on a large scale. Compared to other countries where being a Christian is illegal, the United States is quite a safe-haven for us. Many Christians tend to get riled up over things that happen in politics that don’t conform to their views, but I also think it’s important for those who aren’t Christians to have freedoms as well. We shouldn’t encourage their sin, but in the States, they have the right to. Taking away people’s choice isn’t the way to minister to them. Instead, unless Christians are directly being persecuted, the church is being attacked, and we are told to NOT worship Christ, then we should respect those in power knowing God allowed them to be there. If we are infringed on, then the mindset of Peter here is important. Being willing to die for our faith gives us an entirely different outlook on how we view it. The examples from the Bible that you mentioned are just some of the many we can use as an example for how we are to stand up for our faith. Jesus died for us yet sometimes we are still afraid to claim to be a follower of him. The examples that you listed are of people who were willing to give their lives to be obedient to God, even though they were simple tasks that were asked of them. People think getting a tattoo of a Bible verse, or a cross on themselves means that they are standing up for their faith and following God but it should go much farther for us. Every action and decision we make should be based on what we think should honor God. It will not always be with your life on the line, but we should always make the decision to obey God. I can agree to the wholeheartedly that this is a big thing in our world, ” I will not be silent, God wants me to speak” I would like to say that I have never done this but it would simply not be true. I believe that saying this in the wrong context could most definitely be taking the Lord’s name in vain. The time that I can remember doing this without a dought was when I was headed to youth group my senior year and I was speeding, I got pulled over and I used the excuse that I was on the worship team for youth group, and I was why I was running late because I forgot to print the cord sheets. even though all of that was true, I did not need to use all of it to get out of a ticket, later on, I realized I just used the Lord’s name in vain. this is exactly what I was getting out of your blog, no matter what I will not stop talking abought Jesus, but not for ourselves, but rather for the Lord’s kingdom.